There is just so much hoopla about certification these days. The usual media outlets are reporting how difficult it is for artists to achieve a certification due to piracy/copyright infringement. And if the artist is on a major label, the yelling is even louder. And when artists do get a platinum certification these days, it is reported by everyone. Of course, the certification process once upon a time was based on SALES and sales only. It took into account the people owned the music they purchased and really liked it. The fact that people might not have listened to the music over and over again, didn’t matter. Ownership of music -> registers a sale, which counts for certifications and generates a lot more money for the artist and the label then streaming services do. Access to music -> registers a sale by following a formula. 1,500 streams equals 10 tracks which equals one album purchase. The one album purchase counts for certifications and the streaming equivalent of sale doesn’t generate as much income for the artist and label then the sale of a mp3 or a CD or vinyl does. 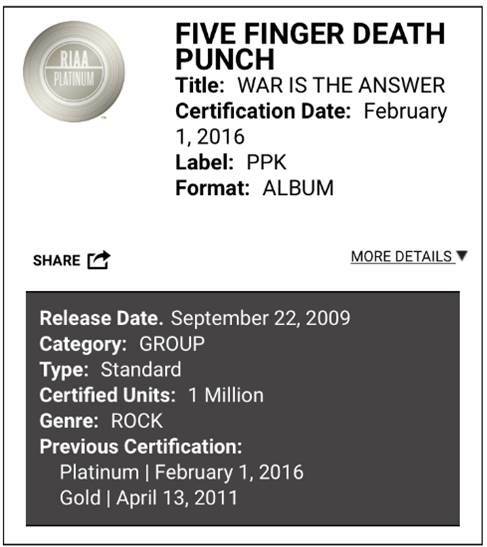 Five Finger Death Punch has a PLATINUM certification from the RIAA. Seven years after the album was released. For a band that plays to a niche audience this is exceptional and proof that metal and rock fans are avid music consumers. The viewpoint from the past always was “if your album goes Platinum, it means the public has accepted it” and when others see the love that people are giving the album, more people are going to go and check it out. Music is and always will be about longevity. Will people still be interested in the music, many years after it was released? Apart from selling a decent amount of product, Five Finger Death Punch are also one of the bands with decent streaming numbers. This tells me that people are listening to them on a consistent basis. “Fantasy” from Aldo Nova went Gold within the same year it was released in 1982. But it wasn’t until 1989 (seven years later) that it was certified platinum and by 1994 (12 years from when the song was released and 5 years from its Platinum certification) it was certified double platinum. If you apply that formula to FFDP, then “War Is The Answer” should be certified double platinum by 2021. Is this such a bad thing? According to the ones that want to be paid straight away it is. For a lot of bands, a loyal fan base is monetized to maximum effect. Dream Theater and Machine Head are two bands that have a small (compared to other bands) but high net worth fan base. Dream Theater only has a Gold Certification (they have other DVD/Video certifications), that came three years after “Images And Words” was released. This sole certification hasn’t stopped Dream Theater from having a career. Another band, Breaking Benjamin is also the same as Dream Theater and Machine Head. Breaking Benjamin also received a Gold Certification last year for an album they released back in 2002. Yep that’s right people, an album released 13 years ago is still in the public conversation. But what Breaking Benjamin has going that the other bands don’t is the singles. Their singles are pushing on double and triple platinum certifications. Remember what I mentioned earlier. Music is about longevity and will people still be interested in the music, many years after it was released. But to the ones that want to be paid straight away, this is a problem. 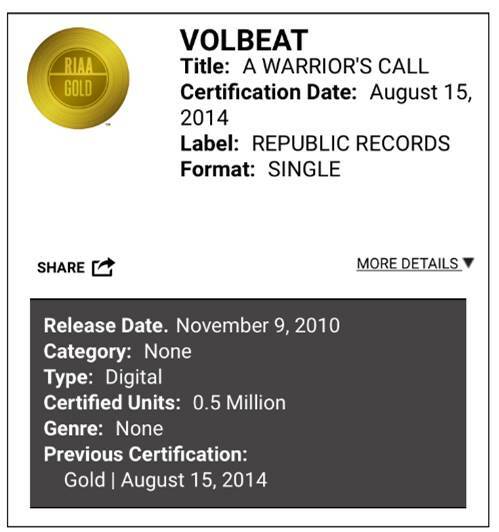 Volbeat is one of those unsung heroes here. A hard-working band, that tours like crazy, building their audience, city by city, state by state, country by country. Known in Europe, it wasn’t until Metallica put them as openers in the U.S Death Magnetic trek that Volbeat started to get traction in the U.S.
And then their albums started selling. And then they went out on their own, and the shows kept on selling out. Certifications are nice to have. But they are not the be all and end all to have a career in music. Longevity and people listening is the key. I have read a few rock bio’s and man, these rock stars go to town on the producers that were involved with their hit albums. Mike Portnoy from Dream Theater goes to town on Dave Prater who produced “Images and Words” which to this day, is Dream Theater’s most successful album. Dee Snider and Nikki Sixx go to town on Tom Werman, who for Twisted Sister was involved in “Stay Hungry” and for Motley Crue, he was involved in “Shout At The Devil”, “Theatre Of Pain” and “Girls, Girls, Girls”. Let’s look at Tom Werman. The facts are out there. Most of the bands that he produced, achieved great commercial success. The majority of these successes happened during the heyday of hard rock music on MTV and when the recording industry abandoned hard rock acts to chase alternative grunge acts, Werman was part of the collateral damage. Which is a shame as Werman is a rarity. He forged a successful career as a heavy metal and hard rock producer because he was able to identify and feature the pop elements in the music of the bands that he was producing. Coming from an A&R background his whole set up was to get the band onto radio. He knew the game. If a band he worked with could get a hit single, it would translate into sales of millions of albums. He also was a producer that didn’t really have an engineering background like Ron Nevison, Andy Johns, Jack Douglas, Bob Rock and so forth which freed him up to focus on other tasks like refining the songs and getting the artists to decorate the songs accordingly. To be a Producer is a tough gig. You are there to realise the bands musical vision. The producer is basically a hired independent consultant, paid by the band through a label advance and the band is perfectly free to replace the producer at any time, which is why the stories against Werman lack authenticity. Werman is probably best known these days for producing Motley Crue’s “Shout at the Devil” (4x Platinum by 1997), “Theatre of Pain” (4x Platinum by 1995) and the “Girls, Girls, Girls” (4x Platinum by 1995) albums. Werman has gone on record to claim that Nikki Sixx was a friend until he revised history and created a work of total fiction in the “Heroin Diaries” book. John Corabi even questioned the authenticity of “The Heroin Diaries” along with Dee Snider. However, Werman worked on other projects as well. “Tooth N Nail” was released on 1984 and the album reached PLATINUM status in the U.S in 1989, after the mega successful “Back For The Attack” album along with MTV, got people interested in Dokken’s back catalogue. Tom Werman produced the “make or break” album and according to Don Dokken, Werman, almost came to blows with George Lynch during the recording. It got that bad, that at one stage, Lynch said to Werman that he will kill him. The issue arose when Werman asked Lynch to play a more substantive lead break for a particular song, which Lynch objected to. Twisted Sister’s “Stay Hungry” came out in 1984. In that same year the album went GOLD and then PLATINUM. Twisted Sister was everywhere, largely thanks to their clips doing the constant rotation on MTV. Dee Snider was a star who was also everywhere. Finally after paying his dues for 10 years, he was in the mainstream. By March, 1985, the album achieved 2 x PLATINUM status March 19, 1985. Then 10 years later, in November, 1995, the album achieved 3 x PLATINUM status. Werman has stated in interviews that he feels that Dee Snider was unable to share credit for a hugely successful LP hence that is the reason why Snider has spoken negatively about Werman. Snider has a different view. In his book “Shut Up and Give Me The Mic”, Snider goes into detail about his relationship with Werman. First, Werman wasn’t their choice at all for producer. He was pushed onto them by Atlantic Records. Second, in a meeting, Werman was asked a question by Snider that if Werman was to put his A&R hat on, would he had signed Twisted Sister. Werman answered NO. Then there are further stories on the recording process and how Dee Snider had a routine to write songs for the next album, while the current album was getting mixed and finalised. However this didn’t pan out because Mark Mendoza who normally handled all of the production and sound duties refused to get involved due to friction with Werman which then left Snider to deal with it, which in turn meant, no new songs got written. A point to note about Werman is that while he was at Epic Records his specific job was to get the bands on the radio. In order to get bands onto the radio, they needed to have singles. That is why Doug Morris (while he was president of Atlantic Records) called Werman to make a hit with Twisted Sister. That is why Doug Morris refused to hear Snider’s pleas to remove him. A general rule of thumb for Werman was to ensure that each record had at least two “singles” as he knew that hit singles would sell several million albums. Kix released their self-titled debut album in 1981 and it wasn’t until their fourth studio album “Blow My Fuse” released on September 12, 1988 that they broke through. By November 2, 1988, seven weeks later, the album was certified GOLD by the RIAA. In May 1989, the single “Don’t Close Your Eyes” was released and by February 5, 1990, eight months later, the single was certified GOLD by the RIAA. Finally, on August 28, 2000, the “Blow My Fuse” album was certified PLATINUM by the RIAA. Yep, that is almost 12 years from when it was released. Don Purnell of Kix (who was the main songwriter) distrusted Werman, however as others have mentioned, that was who Purnell generally was. For Kix the success of “Blow My Fuse” came from a change to Tom Werman, a change to a better and aggressive manager in Mark Puma who got Atlantic to get behind the record and promote it, a natural progressing in the songwriting department and perfect timing. Poison’s “Open Up and Say Ahh..” was supposed to be produced by Paul Stanley however due to schedule conflicts, Stanley was unavailable and Tom Werman was in. Keeping with Werman’s credo ensuring that each album he works on will have at least two hit singles, “Open Up And Say Ahh…” had three. “Nothin’ but a Good Time” is still a party anthem decades after its release, “Fallen Angel” is the clichéd moving to the big city to chase your dreams and the timeless classic “Every Rose Has Its Thorn”. Other albums that Werman worked on during the eighties are LA Guns “Cocked and Loaded” (their most successful), Junkyard’s self-titled debut (a cult classic), Love/Hate “Blackout In The Red Room” (should have been more successful), Babylon A.D “Nothing Sacred” (a very underrated album that deserved more attention), Steelheart “Tangled In Reins” (a solid follow-up that did well just before the Grunge movement), Lita Ford “Dangerous Curves” (she was on a downward career trajectory) and Stryper “Against The Law” (their least successful in sales however the album is chock full of fan favourites and live staples). In the end his hit ratio was on average 1 out 3. Which means that one album out of three reached at least a GOLD status in the U.S. That is a respectable stat and if there is a history of Glam / Hard Rock, Tom Werman will and should be part of it.